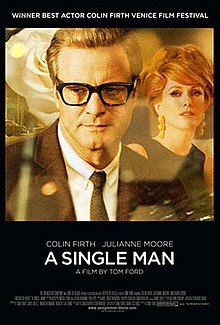 Visually exquisite and featuring a career-redefining performance from Colin Firth, Tom Ford’s A Single Man is still mostly shimmering surface with only fairly pat conclusions to make about the big questions at its core. The central visual metaphor of his film was, I must say, borderline goofy: whenever Firth’s George Falconer is experiencing a moment of particular life-is-beautiful poignancy, the washed-out early-60s colour pallette suddenly suffuses with warm light. It’s not quite black-and-white-to-colour in the Pleasantville mold, but it gets tedious the more times Ford choose to employ it. Although Firth’s performance is quite fine as a collection of well-observed and animated moments, when we’re supposed to see down to his depths, we get little beyond platitudes. As a series of interesting interactions between Falconer and the people he meets (the innocent daughter of the nuclear family next door, a close friend and old flame who never gave up the ghost, a James Dean-type Spanish immigrant, a bright and challenging student from his English lecture played by the superb young actor Nicholas Hoult), the film stands tall. But the use of Falconer’s inner-voiceover telegraphs its potential meanings and winds up reducing their many possibilities to a greeting-card conclusion: Enjoy life while it lasts. Oh, and Mad Men fans should enjoy the many early-60s design cues, not to mention the cameo appearance of Don Draper’s disembodied voice. A nice, well-crafted film, but nothing terribly special.